Read ¡THE NIGHT BEFORE NAVIDAD! 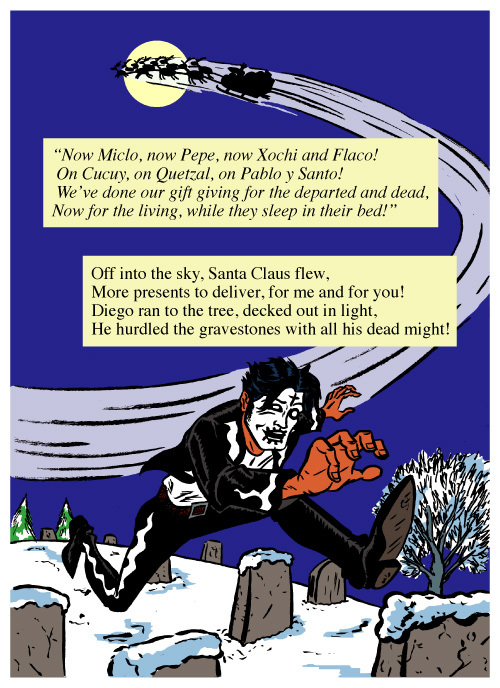 I first wrote this poem, a mash-up of Dia de Los Muertos and Christmas, back in 2006. 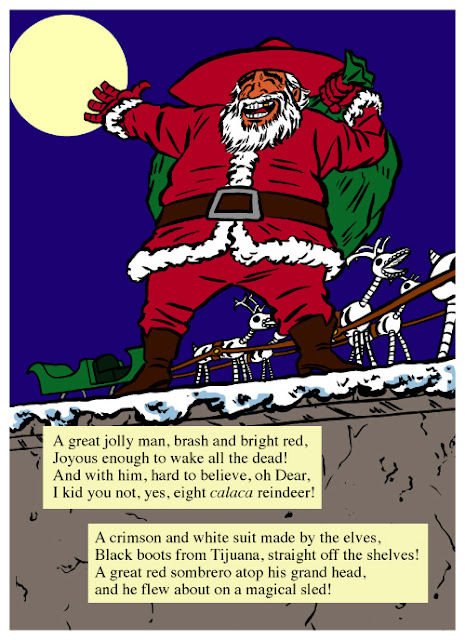 Last year I finally got around to illustrating it. My Christmas story starring El Muerto, The Aztec Zombie. Thanks to everyone who's paths I crossed this past year. In person or online, in one way or another, we've connected in various ways.... Wishing you all the best this Holiday Season! Going back over the past 17 years has helped me relive some warm memories. I look at a lot of it as a combination of hard, diligent work mixed with some 'how did I get here' moments! But it all comes from one's desire to leave a mark, to leave your signature on that great landscape we all live through for any certain number of years. 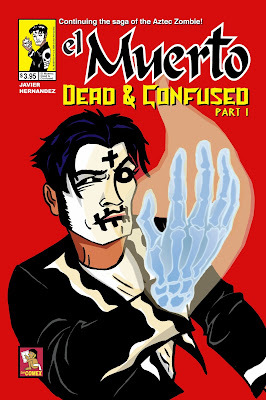 El Muerto, and any work I do, any work anyone creates, is the result of making the effort to start a project or goal. To express an idea. We ultimately do it by ourselves and for ourselves, at least that's my initial starting point. But I've reached out to people for any number of my projects, sometimes for actual assistance, sometimes for feedback or advice. You form partnerships with individuals and organizations, you work with others in pursuing your dreams, and sometimes theirs. 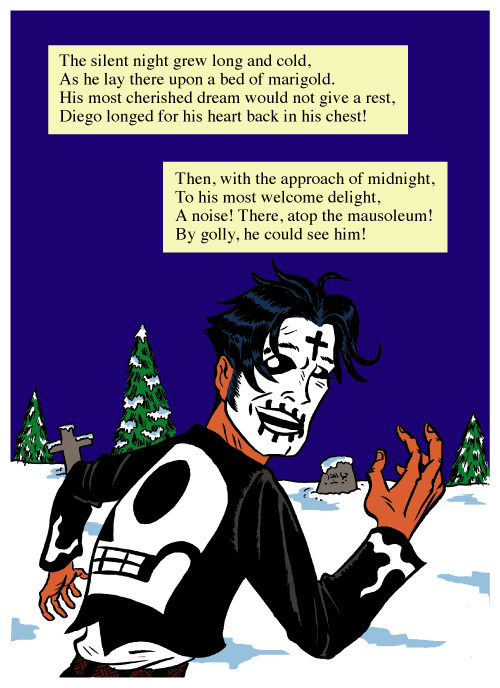 Sometimes El Muerto comes back to me via someone else's hands, believe it or not. 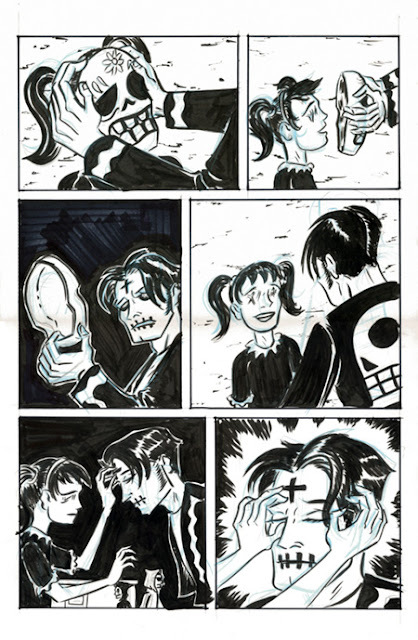 Over the years, I've had the good fortune to receive artwork of all kinds based on El Muerto: drawings, paintings, custom action figures, statues, etc. 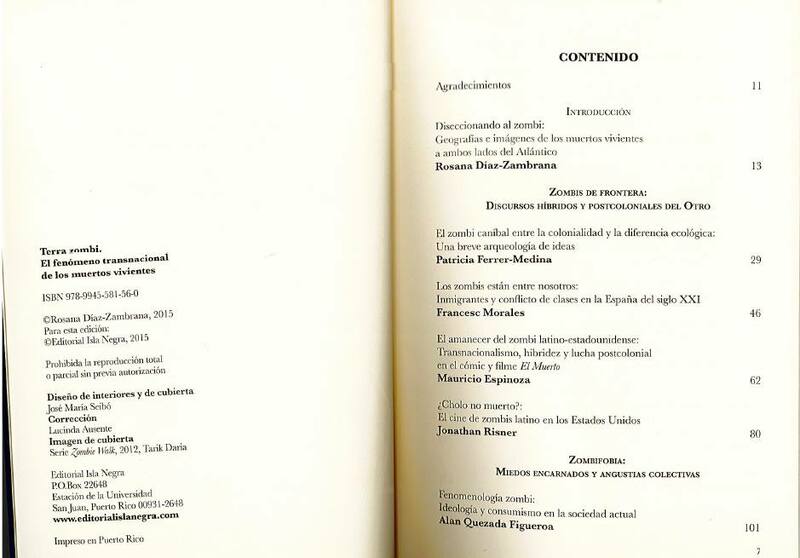 I'm always honored to be the recipient of such work. 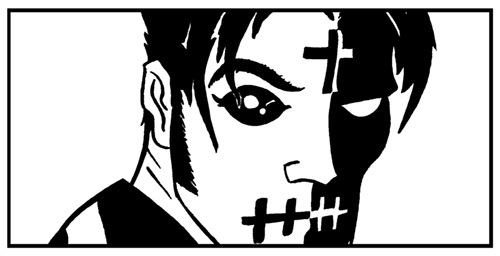 I like contributing my own interpretation of other artist's characters, so getting such work myself is inspiring. 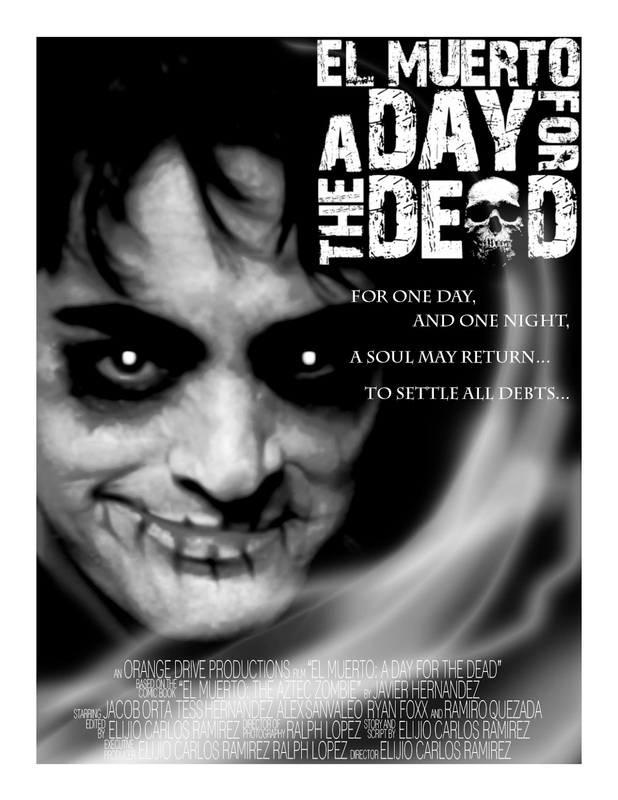 This past May I received an email from an individual informing me that he had made a fan film starring El Muerto, A DAY FOR THE DEAD. 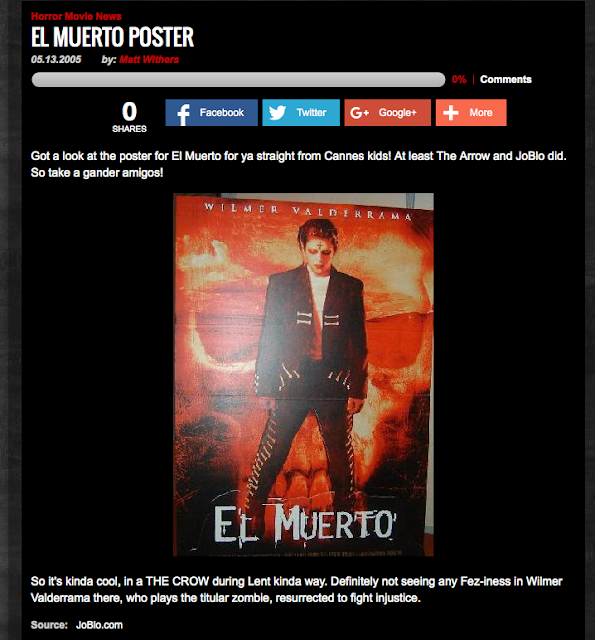 He was going to screen it at the Phoenix Comic Con, which I was actually scheduled to be a guest of. 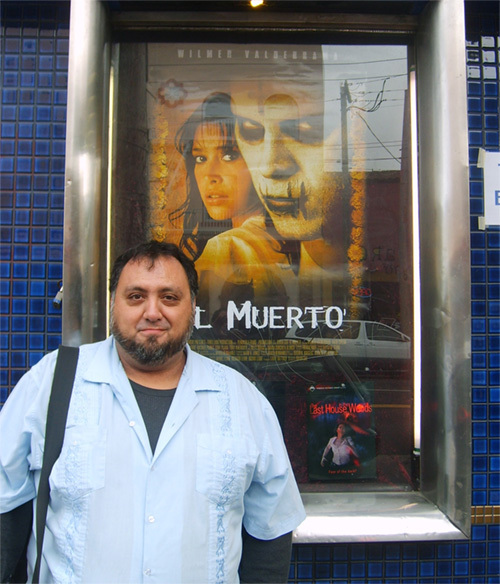 So I told Elijio Carlos Ramirez, the writer/director of the film, that'd I be attending the screening. The film was an exhuberant take on the character, one I found myself enjoying immediately. The amount of time and energy, not to mention passion, Elijio and his fellow filmmakers put into making it was charming. I was really flattered with the whole experience. 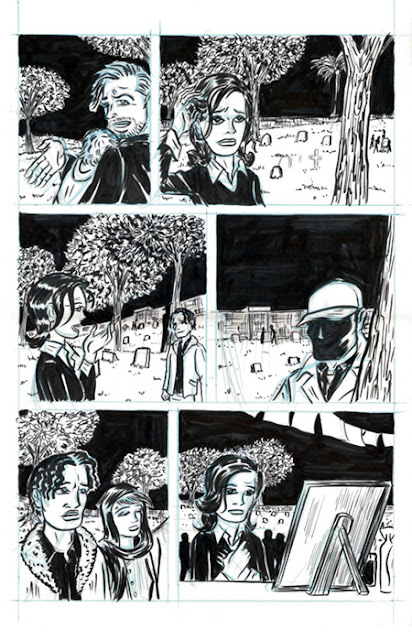 The plan is to show it online eventually, but Elijio's taken it to several film festivals in the meantime. 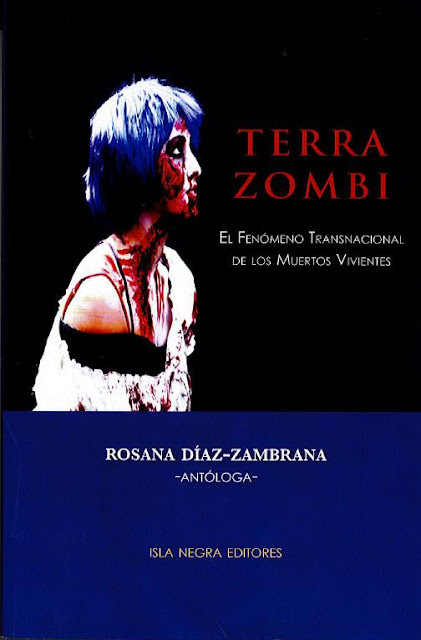 Just the other day I was informed that a new book, TERRA ZOMBI (an anthology on zombies in pop culture) was just published in Puerto Rico from Editorial Isla Negra. The book features an essay on El Muerto contributed by poet and scholar Mauricio Espinoza. I haven't read the piece yet, but it's an honor to have the character written about in such venues. There's been other opportunities like that over the years, and it's no less humbling each time. 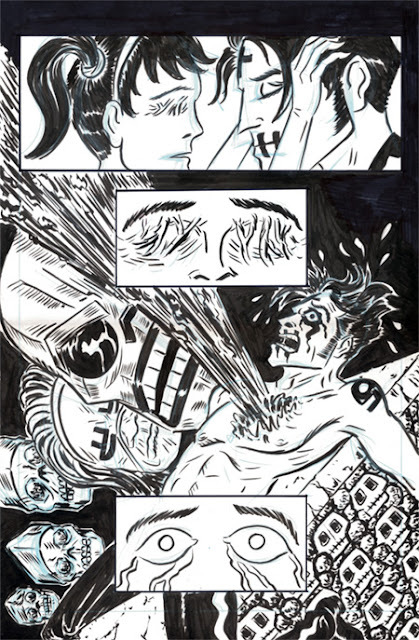 As for what you can expect from me next... As I mentioned in an earlier post in this series, I've got a new chapter of the El Muerto story on my drawing table. This will be published in the early part of 2016, as part of a trade paperback collecting the earlier El Muerto comics. 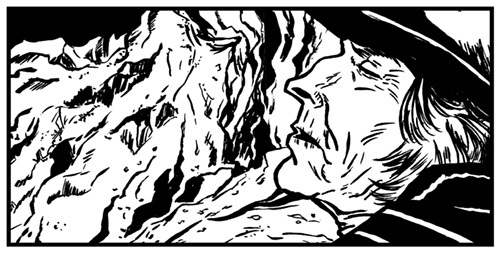 So a lot, if not most, of the Holiday Season will be devoted to finishing this up, the long-awaited conclusion to DEAD & CONFUSED. As an artist you create something, and you hope others like it as well. You become the custodian for that character. And over the years you find a lot of goodwill comes back to you because of it. 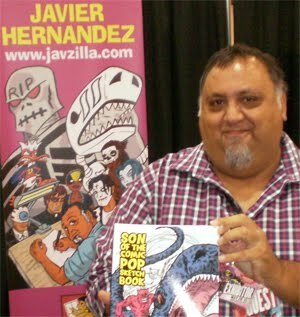 I couldn't possibly thank everyone who's supported my work, embraced my comic book character, offered a helping hand along the many years and countless miles. But I appreciate each and every person. All of you! 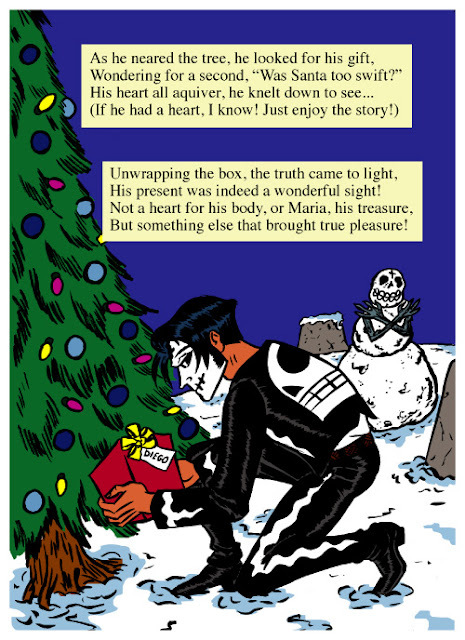 Thank you for reading along here on THE 12 DAYS OF MUERTO. Lots more days ahead! Watching the scenes play out before me, having seen most of them being filmed, was such an intense rush. Soon as it was over he asked if I'd like to see it again, which of course I did. 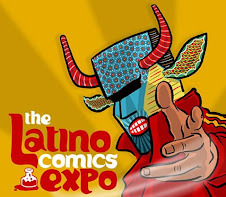 This was really the beginning of the promotional push for the film, as we soon booked a booth and a panel at the San Diego Comic Con. This was back in early 2005, when you could actually contact the convention this close to the event and secure such arrangements! That summer, after having spent the previous 8 years in Artist Alley, I found myself on the main floor of the convention with a full booth (paid for by the producers, naturally!). On our panel (moderated by my friend and fellow comics creator Mort Todd) we had stars Tony Plana, Joel David Moore and Wilmer Valderrama , as well as myself and producer Larry Rattner. It was cool to be up on the stage, having sat in the audience myself over the years listening to similar panels. But here the audience was gathered to see our preview, and definitely see our star Wilmer (but I spotted a lot of my friends sprinkled throughout the crowd!). 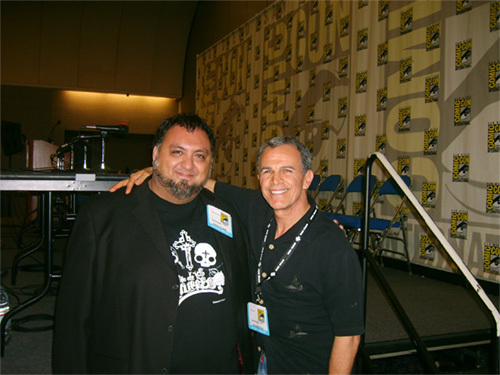 I spent the whole weekend at the booth, greeting fans and hyping up the movie. Wilmer and the other stars even came down for a bit after the panel, adding to the excitement. At one time, actor Seth Green walked by, and saw the poster with Wilmer on it, his eyes fixated on it as he kept walking by. I yelled out "Hey, Seth, that's your buddy Wilmer on there!". He raised a hand and smiled as he continued on. That was a funny moment. 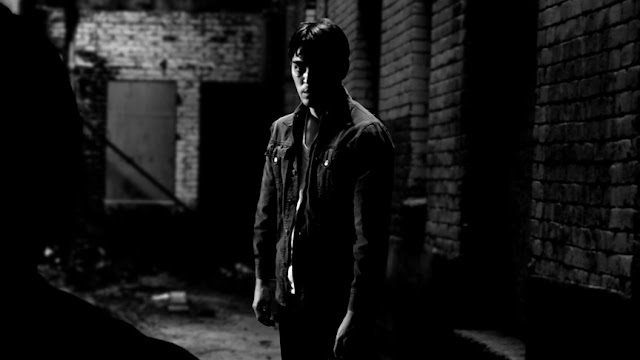 The film still needed post-production work on it, mainly digital effects, scoring and such. 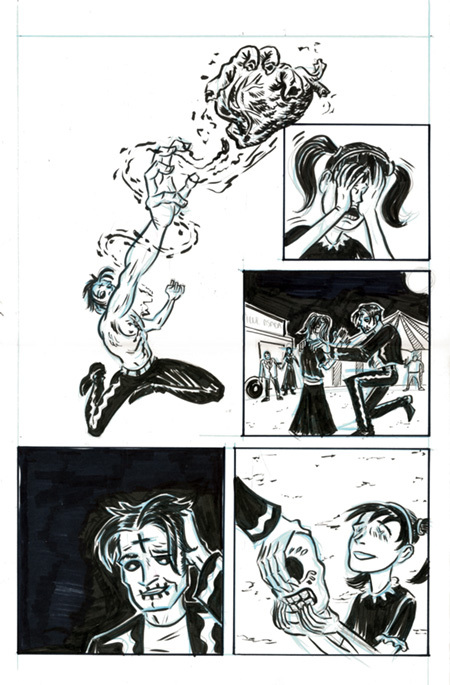 So I used the rest of 2005 to return to the drawing board, and work on the next chapter of the El Muerto comic. It was interesting to sit there at my desk, all by myself, armed with my pencil, and once more be the sole voice in the telling of the story of my character. Having seen a whole team of creative people gather together to create the film, even being part of that team myself, it was satisfying to once again, quitely and at my own pace, create the latest chapter. 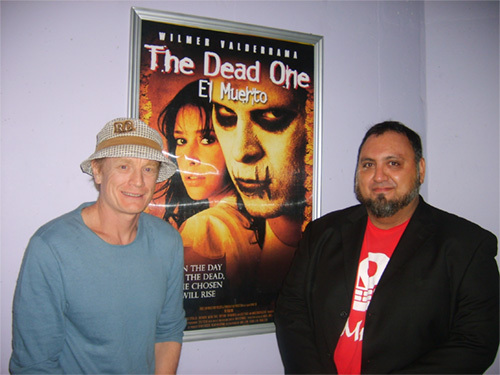 By September of 2006, the film was completed and ready to screen. The first time I saw the film was in a screening theater they had rented on the Warner Bros. lot. We arrived at the theater but then they told us it was moved to another one a few doors down. Evidently, Clint Eastwood was showing the WB executives an early print of FLAGS OF OUR FATHERS. I figured if I'm going to get bumped out of a theater, better be someone of Clint's stature! 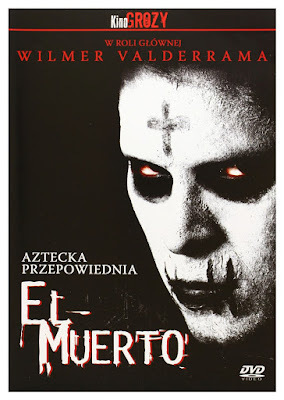 Seeing EL MUERTO, complete from beginning to end, was a most memorable experience. I was invested in the movie as a viewer as much as possible, trying not to see it through the eyes of a creator or filmmaker. The fact that the bulk of the movie was original material from Brian's script (with my characters and origin story being the spring board) allowed me take it in as a fan. 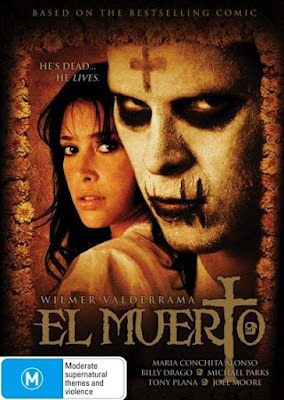 Seeing my cameo was particularly surreal, in that I'll forever be immortalized on screen with my character at those cemetery gates on East Los Angeles. It's a nice little atmospheric film, letting it's cast of characters wind through the story as it unfolds before them. I still enjoy watching it every so often, letting myself be taken along for another journey by the characters. Sure, I could always sit there and wish we had lots more money for more elaborate set pieces and explosions or whatever, but getting that movie made is an experience I don't take for granted and I'm very satisfied with our final product. 2007 came around and it was time to hit the film festival circuit. Here on the west coast I was able to attend all the screenings: Los Angeles, Oxnard, San Diego, San Jose, San Francisco and also one in Texas. And while I didn't travel with it, it did screen in New York and Toronto, Canada. Not too bad for a small little independent movie. The festival screenings were as fun as you can imagine. There really is an undeniable attraction to all the hype and excitement of movie screenings and the whole festival circuit. There's Q&A with fans and press, and after-parties of one sort or the other. A whole different level of engagement than we normally find in the comics biz. 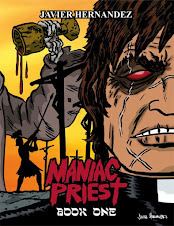 We also prepared for a DVD release and that was another thing I was heavily involved with. 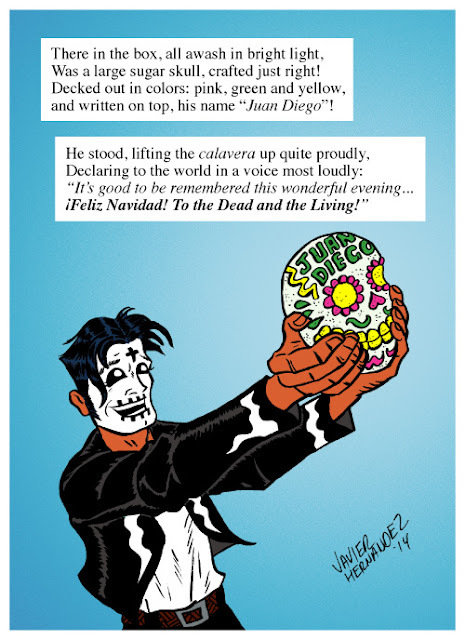 I suggested some of the special features, such as an art gallery with guest artists that I handpicked, a how-to-draw El Muerto tutorial, and the El Muerto mini-comic made exclusively to be included in the DVD package. I also got to record the commentary on the DVD with our director, Brian. 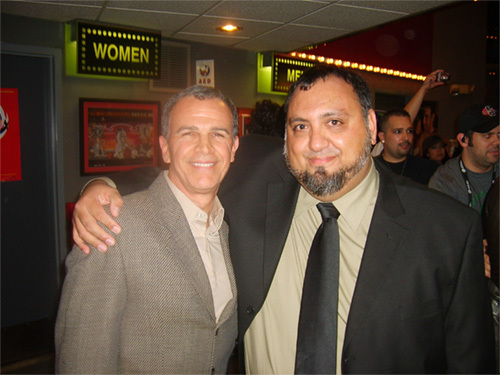 In September of 2007, we even had one more final victory run for the film, a one-week exclusive engagement at the Laemmle's Grande 4-plex in Downtown Los Angeles. On the Opening Night our director, Brian Cox, Larry our producer and myself held a Q&A after the screening. I went at least twice during the week it played there, and lots of my friends reported going throughout the week. One friend even told she and her family ran into one of our actors, Billy Drago, who was in the audience checking out the film himself! 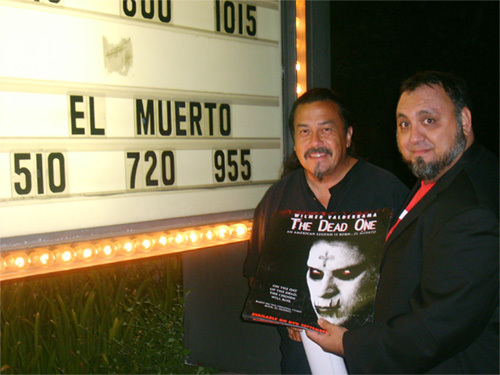 Here's me and Brian by the poster, and my and Martin Espino (a friend and accomplished musician who worked with our film composer to provide authentic pre-Columbian music to the soundtrack) outside by the marquee. With the DVD on the market, and multiple runs on cable tv and streaming services, the film continued to make it's rounds, and I periodically hear from someone who's seen it. Usually at a convention or other appearance I may hear from someone "Oh, I saw that movie! 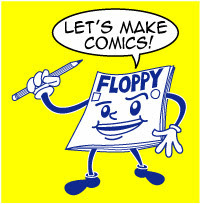 ", to which I always say "Well, here's the comic it's based on!". The movie was a big part of my career, and it continues to be a welcome presence in my life. Tomorrow, we wrap up this series with the 12th day of THE 12 DAYS OF MUERTO. See you then! THE 12 DAYS OF MUERTO: Day 10...Tabloids, car wrecks and the wrap! It really was like that. I remember we'd film for 5 days a week, plus another day would be to work at the producer's office where everybody would prepare for another week of shooting. So basically I had one day off to myself, and that would usually be spent catching up on personal matters, banking, post office...Maybe see some family and friends. Or actually catch time to relax! I remember once I'd be channel surfing, watching a bit of a movie or tv show. But now I started to look at how they filmed it, imagining the hustle and bustle behind the scenes to create the illusion. Then the following morning it was back to the magic playground of making your movie. At one point, the enthusiasm and camaraderie even spread to our catering service. The person who ran our catering truck was a Frenchman, and no kidding, but he prepared some exceptional meals for us daily. Actually, for breakfast and dinner. Complete with full courses of desserts and all kinds of side dishes. 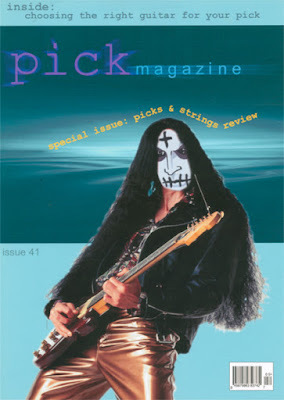 As the production rolled along, he eventually started designing and printing up these mock magazine covers featuring El Muerto, which he'd tape to the side of his truck on occasion. Who would have thought, right?! One late night we were treated to a delivery of In-N-Out hamburgers. (How they got a delivery out to that remote location in the dead of night I'll never know. But then I thought, "Ah, this is show business!"). Word spread that night that singer/actress Ashlee Simpson was visiting Wilmer Valderrama on the set. It didn't seem like that big a deal as most of Wilmer's co-stars from THAT 70s SHOW ended up visiting him at one time or another during filming. Well, the next day when I'm driving back to the location my cell phone rings. I answer it and the first thing I hear is: "I'm a dead man". I ask who's calling, and it turns out it's our official photographer. I had gotten to know him on set over the course of filming, as he and I had pretty much free reign to roam around the whole production. "What do you mean? Are you okay? ", I asked him. I've got a nice collection of magazines with interviews and articles about me and my work, but this one is kind of a special feather in my cap! I mean, in some alternate reality, there's got to be a part of the American Dream where one wants to appear in a tabloid, right? So I'm driving down the 5 Freeway when all of a sudden I hear cars crashing into one another, then out of the corner of my eye I see a spinning car slide over my way. It hits my driver door and knocks me out of the lane, but thankfully I straighten the car then quickly pull over off to the right side of the freeway, out of the last lane. I get out of the car and can see several cars stopped at various points across the lanes. Then I looked back up the freeway and was horrified to see the headlights of oncoming traffic. And worse, a double-decker bus! Next thing I hear is a couple of cars crashing into the stalled cars. I swear, that bus had no way of stopping but it miraculously passed between two other stalled cars, apparently not hitting them. This is becoming a sickening nightmare. I look across the lanes and see a wrecked car against the center divider, with about 3 people standing outside of it. One of them darts across the freeway, toward me. Luckily there were no cars driving through at the moment. He was a young Italian guy, probably visiting here on vacation. I told him to get in my car and we both sat in the front. He was in shock, saying he wanted to go back and get his friends but I told him that they seemed okay and to not cross the freeway again. He put my hand on his chest and I swear, his heart was beating like a machine gun. I tried to reassure him, and calm him down. Eventually the police showed up and blocked off the freeway, attending to people who were hurt first, and getting information from the rest of us. I tried calling my producer Larry just to hear a familiar voice but the reception into that canyon was non-existent. I had no physical injuries at all, and was able to drive home and eventually got the car fixed. But what a story I had for the team the next day on the set! The last day of filming was a memorable one as well. We had started that day around 3pm. Some 14 hours later I was sitting with a few other people under a canopy, with some heaters turned up to full power. This was mid-February in a canyon, so it was exceptionally cold. At this point, I was practically falling asleep from exhaustion. Time was ticking, as sunrise was coming up and they still had to film the final scene, which has to take place in the dark. 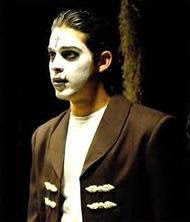 It's the moment Diego crashes his car into a tree, where he's killed and afterwards wakes up in the land of the dead. 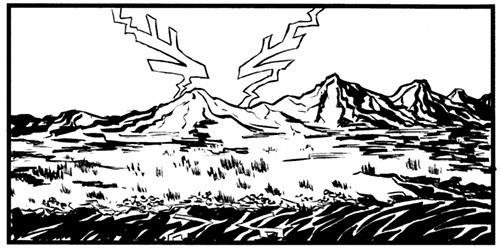 Pretty important scene, and one right from my comic. So, now fully awakened by the excitement of this final scene of our production, I gathered around the location where they were filming. If I remember correctly, Wilmer himself drove the car, but stopping just before he hit the tree. Everything was planned out so his safety wouldn't be in danger, of course. 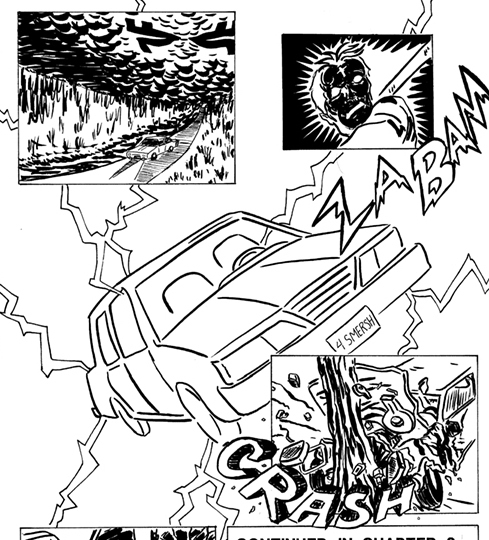 I think our budget was such that we didn't want to actually wreck the car, so some editing in post-production would take care of the crash. He gunned the car, drove it up to the tree then stopped. Maybe two takes, if memory serves me right. The added suspense of the sun slowly creeping over the horizon only heightened the urgency. After they filmed their takes, I saw our director and producer and another crew member huddle together, pacing around as they discussed strategy. 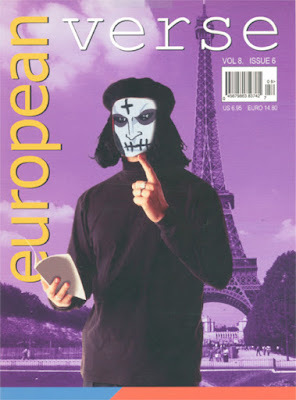 Then, the announcement: "Okay everybody. We're good. Thank you, that's a wrap!". For an exhausted crew working a 15 hour shift through a cold night, there was a huge burst of enthusiasm on display. I imagine it's like this on every movie set, but it was cool to experience it. Especially since it was one's own movie being made. It was like the last day of high school in some regards, because with filming done most of the crew members wouldn't be seen again. The post-production team of editors, special effects/digital crews, etc would be replacing the ones who I saw on set everyday. Lots of heartfelt good-byes that day. By the time I drove home around 7 or 8 in the morning, I hit the prime Los Angeles morning traffic mess. But all I could think about and that very long drive home was all the memories of the past four weeks, and the excitement of what was to come. Tomorrow I'll share the post-production stories, plus the film screenings and eventual DVD release!